It is well and truly Fall. I love this time of year. This is when we have our best weather. Not because the heat of summer has abated, quite the opposite, the weather has finally warmed up. But the sun is less intense. The days are shorter. I hear dead leaves rustling. It's a bittersweet love. In the garden the plants are growing more slowly, some are senescing. 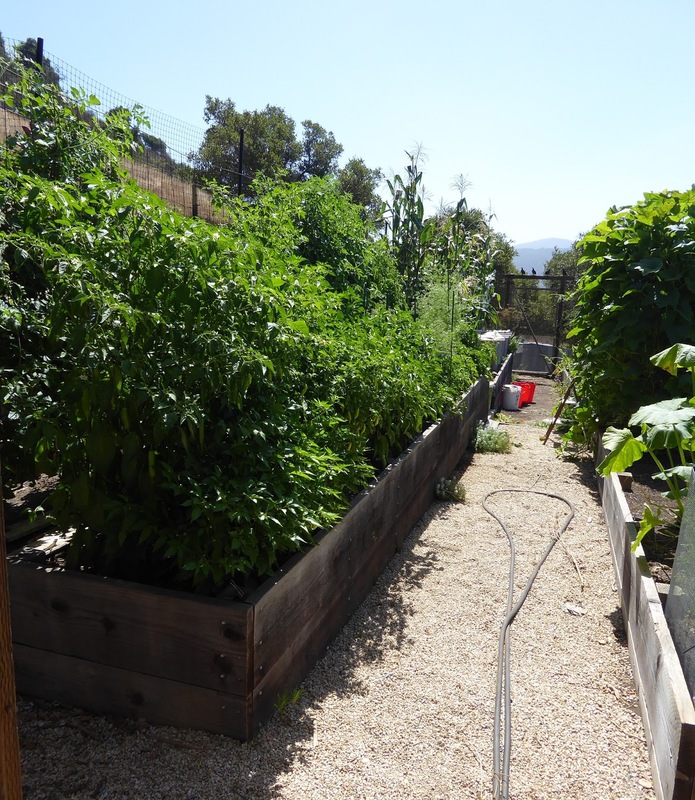 Vegetables and seeds are maturing. I'm waiting for the big Aji peppers to start ripening, they are always the last. I might have a good wait still for the Aji Amarillo Grandes. Last season I was harvesting them in December, January and February. Aji Golden and Joe's Giant are new so I have no idea when they will ripen. Don't know what's up with Aji Angelo, it's larger and more wrinkled than the ones I've grown before. Perhaps I mixed up the labels or it crossed, I grew these from seeds that I saved a few years ago. It will be interesting to see what color it is when ripe, a true Aji Angelo should be red. The dry beans are starting to dry on the vines. The leaves are falling off the Taos Red vines as the bean pods dry. 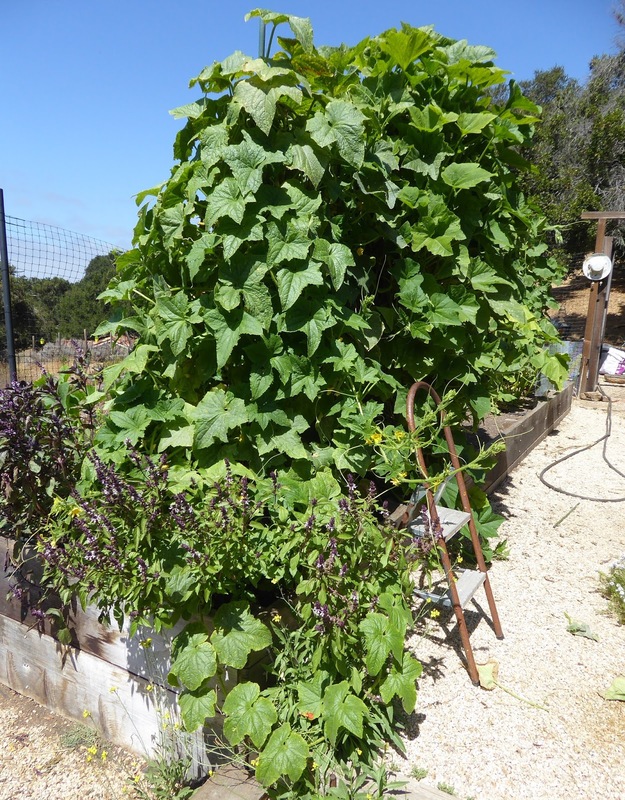 Tarahumara Sitakame is staying green and is sporting a lot of new flowers and baby beans even while there are mature bean pods drying on the vines. It's flowers are day length sensitive so perhaps the shorter days have given it the signal to bloom again. Oh what a tale of woe in the corn patch. 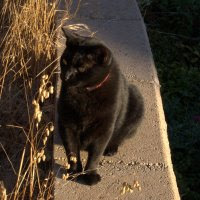 Hopi Greasy Head was the early favorite of the rodents. I thought first that it was rats, but never a one could I snap in a trap, not near the corn at least (got one in the tomatoes though). 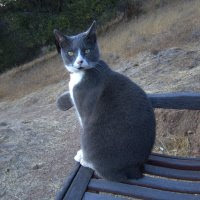 Then I thought perhaps it was ground squirrels because some damage was occurring during the day and I had by accident caught a ground squirrel in a trap intended for rats. And then I finally caught a very large and fat vole under the corn plants. Ah, that made sense, voles are active day and night. I have been searching and searching for their burrows but can't find one. They soon turned their appetites loose on the Santo Domingo Rainbow corn. Are they lazy, do they prefer the Hopi Greasy Head because the plants are so much shorter? They seem to know when the ears of corn are mature and as sweet as they can be. They just chew through the husks, littering the ground with the shreds, until they get to the juicy kernels inside which they devour on the spot. Wrapping the ears in fabric, a tactic which succeeded in protecting the ears last year, was of no avail, they chew right through the fabric. Covering the tops of the ears with hardware cloth, the rodents used to start at the top and work their way down, didn't work this year as it did last year, they attacked from the bottom up instead. 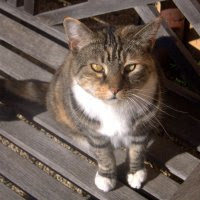 Perhaps half of the Hopi Greasy Head ears have fallen prey to the gnawing jaws of rodents. And they found what was probably the only ears of K'uyu Chuspi that managed to get pollinated somehow. 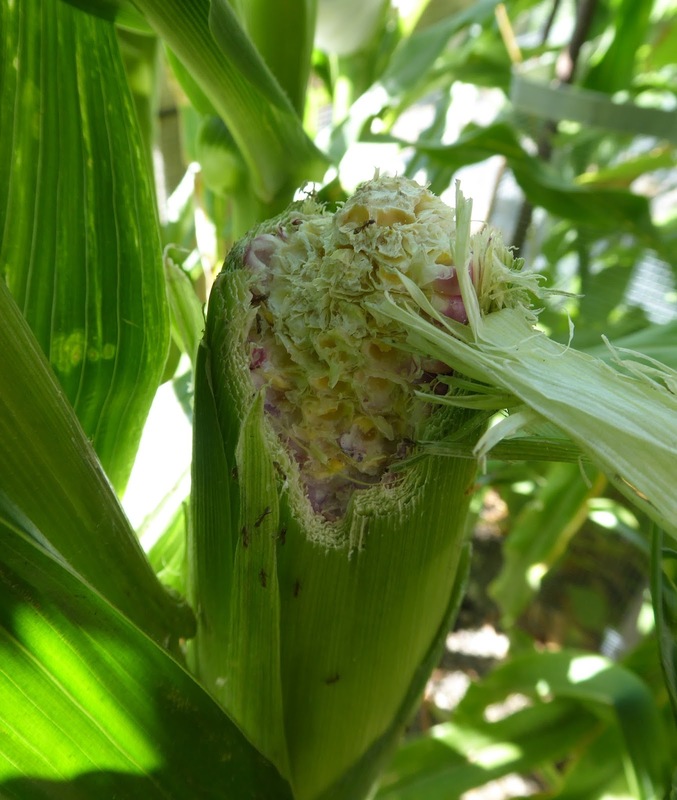 That corn was dysfunctional - the tassels were done delivering their pollen well before the ears revealed their silks. I didn't think any ears had been pollinated but the rodents proved me wrong. There's a few fat ears on the last 2 stalks, but it's questionable whether or not there's any kernels developing. The size of the ears are no indication of what's inside, that corn has the thickest husks I've ever seen on any ears of corn, layer upon layer upon layer of husks until you finally get to a teeny tiny little ear inside. I can't believe the rodents just kept gnawing and gnawing and gnawing until they found the little bit of goodness that was to be found. Won't be growing that corn again. I may not bother to grow any sort of corn again - it just ain't worth the heartache and the battles. The remaining ears of corn are now fully encased in hardware cloth. Eat that you effing batards. K'uyu Chuspi - any kernels in there? 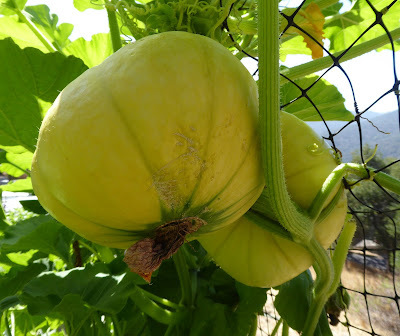 It will soon be time to gather the winter squash. The skins are hardening and the stems are getting corky. Here's what I've been waiting for all summer and of course it's now the first days of fall. Peppers! All sweet peppers so far. Shepherd's Ramshorn has been a regular in my garden since 2012 when I tried a number of short season and/or cool climate adapted sweet peppers. 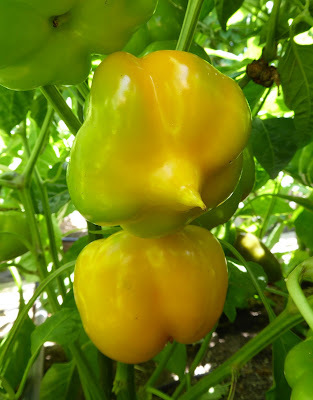 It was an outstanding pepper for it's quality, productivity, and earliness. I tried about a dozen sweet peppers that year and out of all of those there are 3 varieties that have stayed on my must grow list. Shepherd's Ramshorn, Odessa Market, and Lady Bell have been repeat performers for 6 years. Violet Sparkle is back for a second year but only now is it getting a proper evaluation. Last year was a disaster in the pepper patch. Many of the plants were either mowed down by critters or died an early death from powdery mildew. 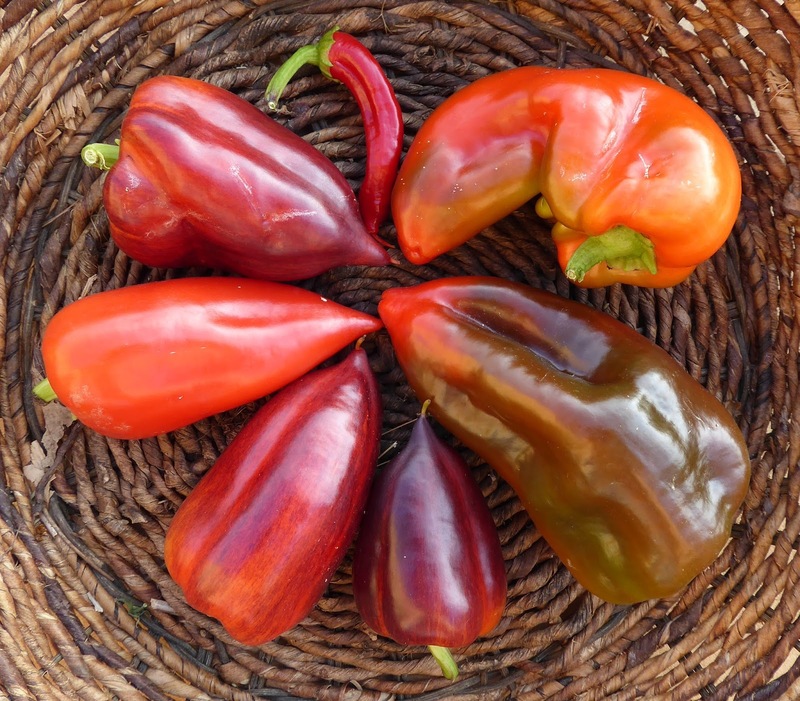 Violet Sparkle yielded a single pepper that ripened in the garden. It was good but one pepper is not enough to base an evaluation upon so I'm trying it again this year. I was waiting for the violet streaks to fade away but it seems that they stay as the background color changes from light green to yellow/orange to red. Those were harvested yesterday and I haven't done anything with them yet so the jury is still out. Back for a second time is Petit Marseillais. It's a nice sweet frying pepper and also dehydrates well. It's quite productive and early and pretty too. So far I've just chopped them up to use in salads and I used some in a simple side dish the other night, cored and stuffed with an anchovy and simply pan fried. It was tasty but I scorched them a bit so I need to try again. New this year is Topepo Giallo. It's a winner so far. The plants are more productive than the red Topepo peppers that I've grown in the past and so far I am impressed with it's sweet flavor and thick crunchy flesh. Back this year are some Florina peppers. I first grew these back in 2015 and I loved the flavor, it was thick fleshed, sweet and spicy but not hot. Last year I tried them again but ended up with very few peppers because of disease and critter problems. 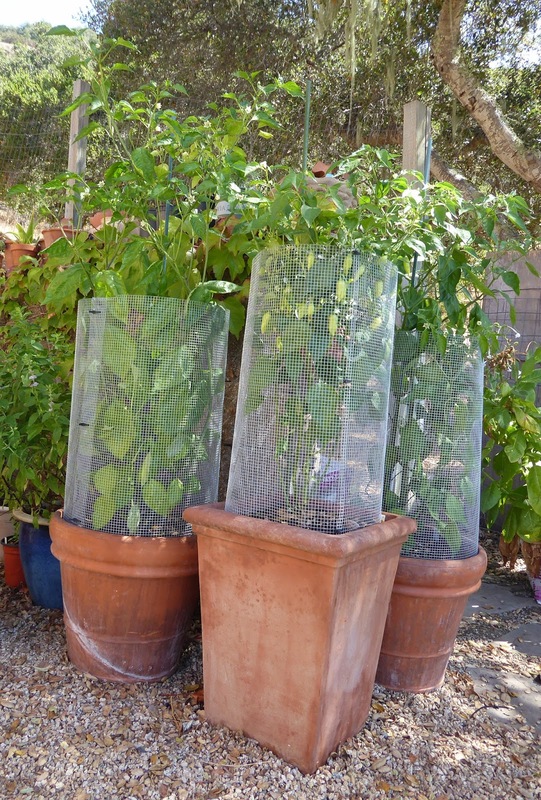 This year I used the last of the few seeds that I received and caged the plants to keep them from cross pollinating so that I could save some seeds and to protect them from critters. Those are the peppers with the tags on the stems, I'm comparing the peppers from the 3 different plants because I noticed some variation in flavor in the few peppers I got last year, including one that had some heat. 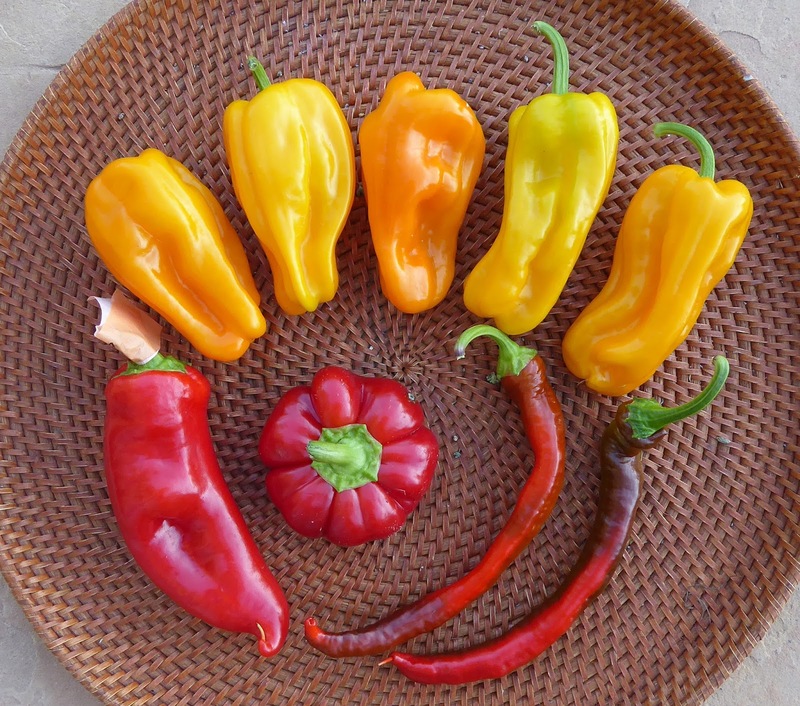 The long skinny ones are a Turkish sweet pepper that I tried last year and what little I got to taste I liked. The problem with them is that my seeds are old and they are not available any longer so again I caged the plants for seed saving purposes. I actually prefer these peppers when they are young and green but I have to let the first ones ripen to get good seeds. 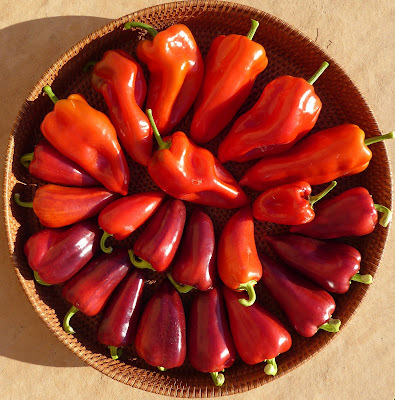 Gogosar is another pepper that is nearly impossible to find seeds for in the US. I got my seeds through Seed Savers Exchange and they no longer offer them so this is another variety that I caged for seed saving. 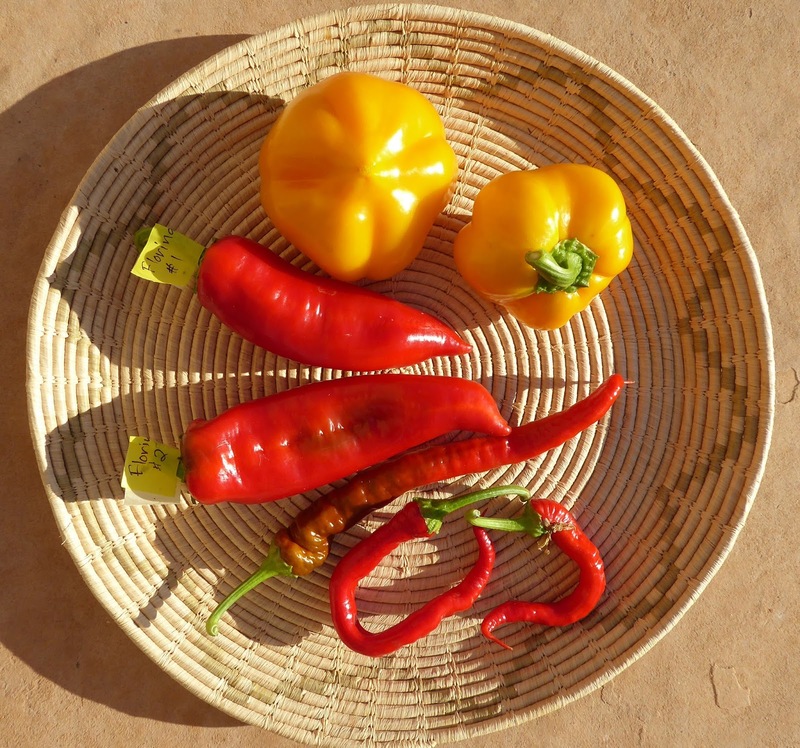 Fortunately, I love these peppers fully ripe. They are very thick fleshed, sweet and flavorful. They are the perfect pepper for stuffing. That's the start of the pepper harvests, there will be more varieties to come in the next few weeks and hopefully the next couple of months. 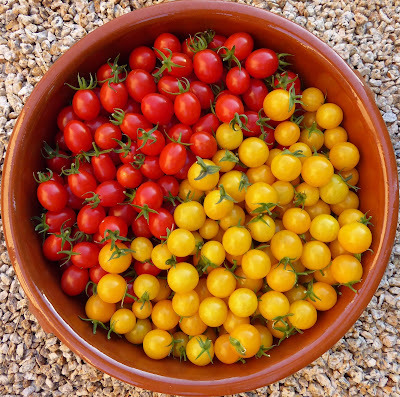 Cherry tomatoes galore! 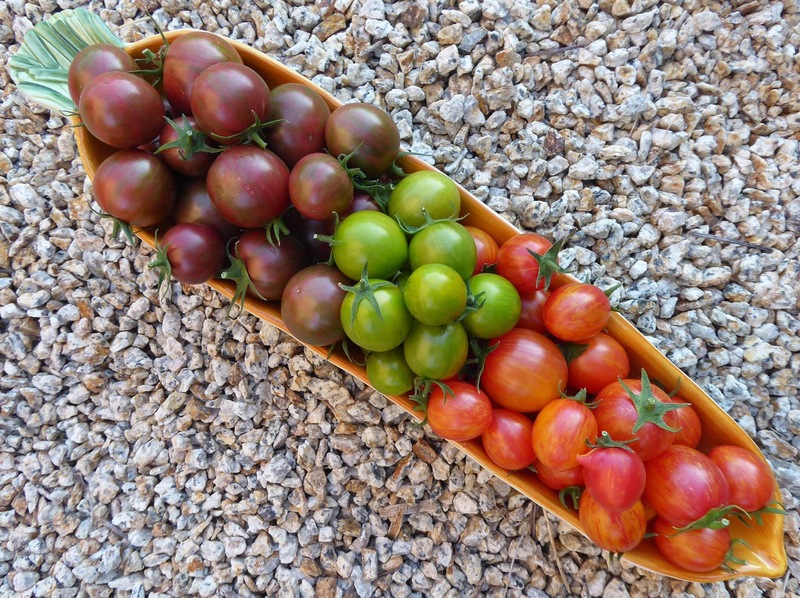 This week the Piccolo Dattero and Sweet Gold plants yielded more than 10 pounds of tomatoes. That's one of two similar harvests shown above. 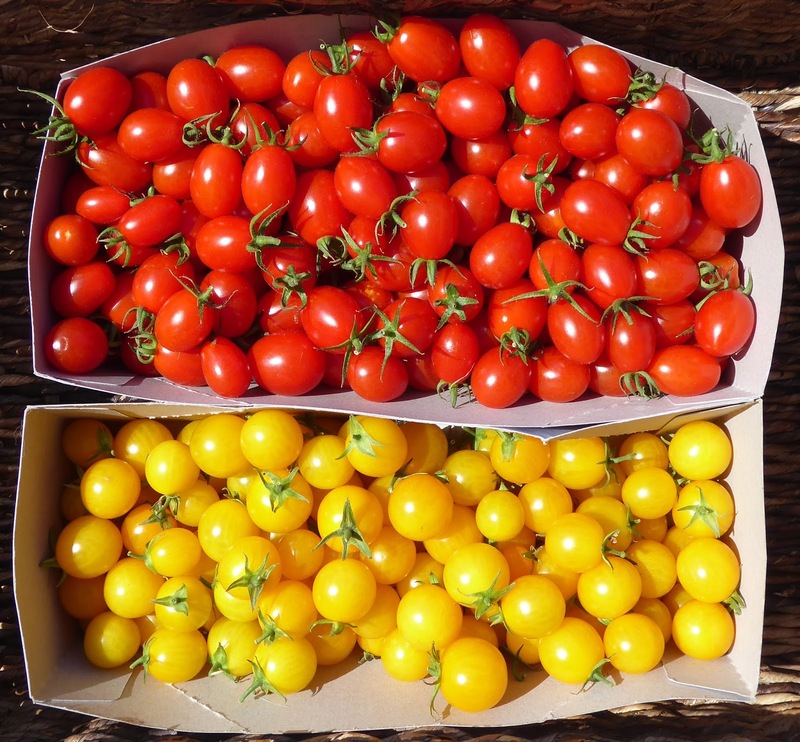 The other cherry tomato varieties still produce nowhere near the yield of Piccolo Dattero and Sweet Gold, but that's ok, there's enough all together to meet my needs. It's fun to have a variety of colors and actually I don't know what I would do with so many tomatoes if all the plants were so productive. 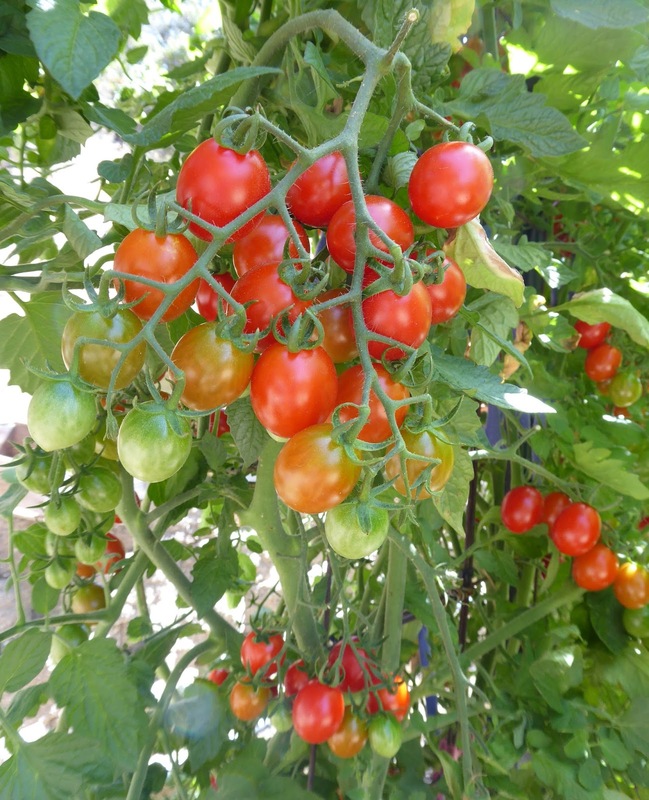 The larger fruited tomatoes are picking up the pace also. 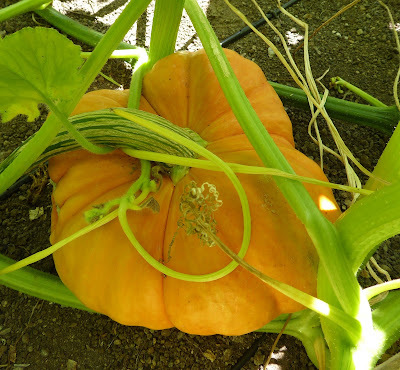 The harvests shown above and below were also just one of two similar harvests. And now on to the green things. 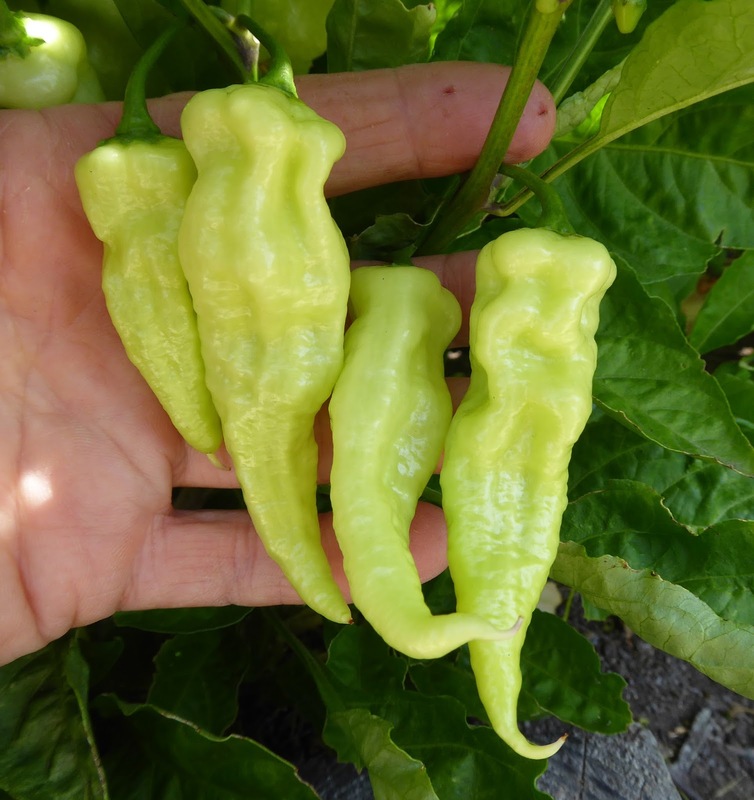 I picked some mature but not yet ripe Shepherd's Ramshorn peppers to use in a favorite Turkish stew of Eggplant, Lentils and Tomatoes with Pomegranate molasses. I'm not a fan of green bell peppers but I have found that the non-bell sweet peppers are good when they are green. 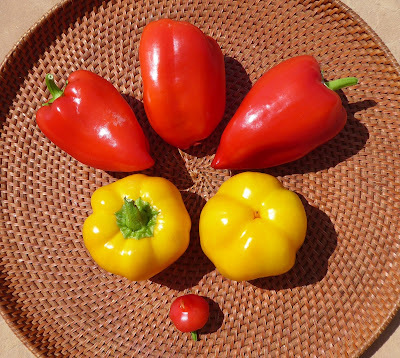 That pepper on the right looks like a bell pepper but it's just one that didn't develop a pointy end. The Tromba D'Albenga vines have made a quick recovery from a big pruning that I did about 10 days ago. 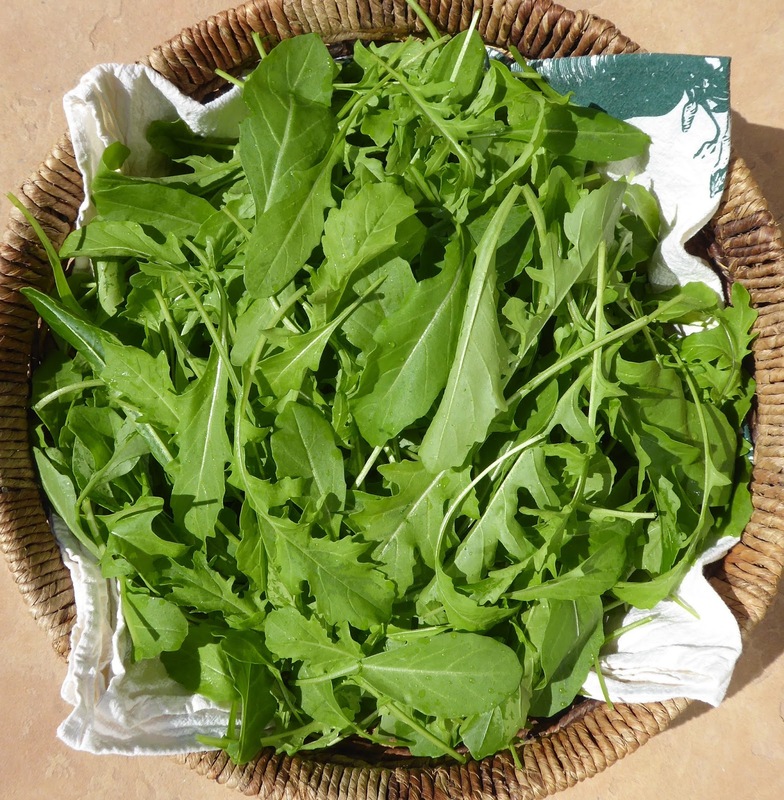 The patch of Speedy arugula and Manoa lettuce was suddenly ready for a harvest. Speedy is aptly named, I sowed the first succession a little more than a month ago and harvested a half pound just a couple of days ago. The extremely hot weather we had a couple of weeks ago doesn't seem to have done any harm to either the lettuce or the arugula, the lettuce is still sweet and the arugula isn't too spicy. I think that keeping the top of the cage covered with a single layer of lightweight Agribon fabric has helped to keep them from getting too stressed by sun and heat. The cage provides plenty of ventilation so the heat doesn't build up inside like it would in a tunnel. Manoa lettuce is maturing just in time for BLT sandwiches and salads. 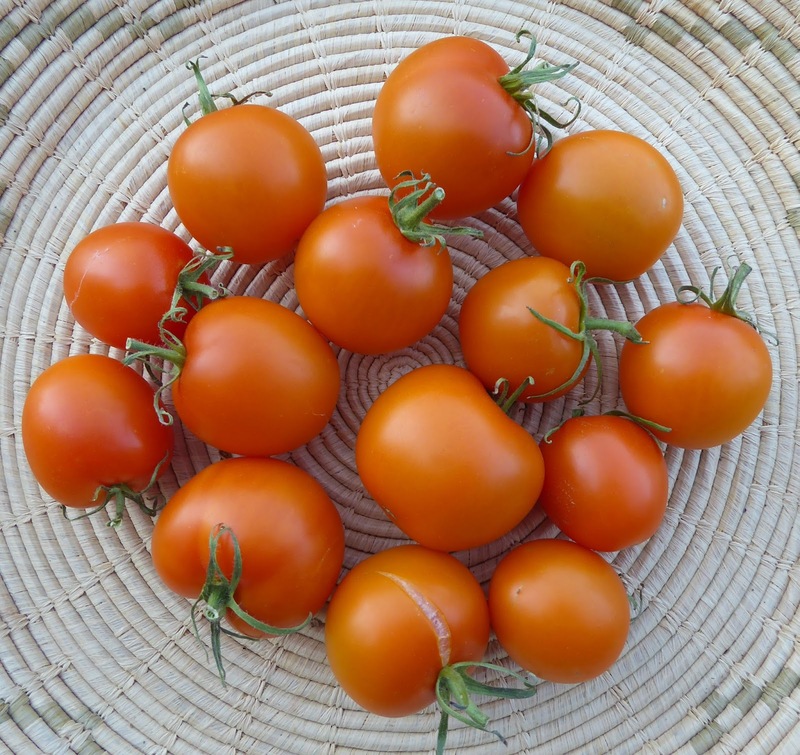 One of my favorite things to do with cherry tomatoes is to dry them with a seasoned salt. I've come up with a combo that I really like and that uses goodies from the garden. The mix is fennel seed, smoked sweet peppers, and a combination of dried smoked onion and dried onion all ground up with sea salt. 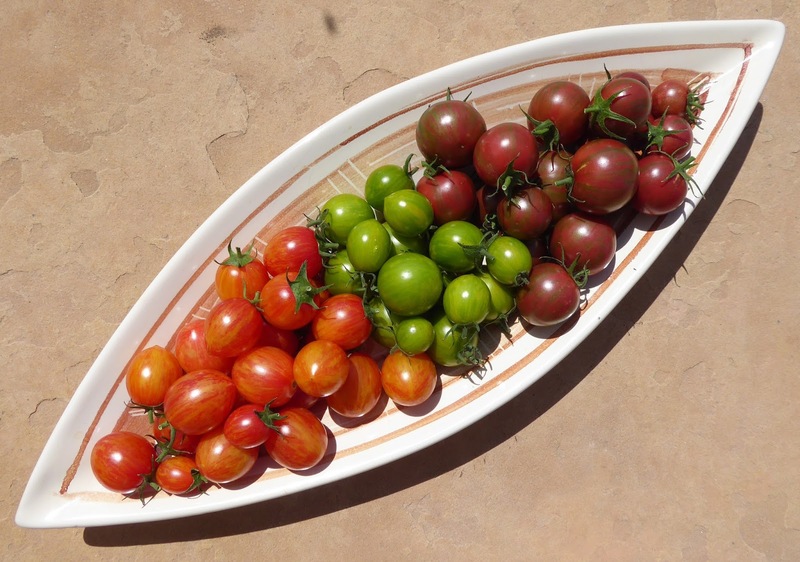 Both the Sweet Gold and Piccolo Dattero tomatoes are delicious dried this way. I also made a Tomato and Ricotta Galette inspired by a recipe I found on Food 52. 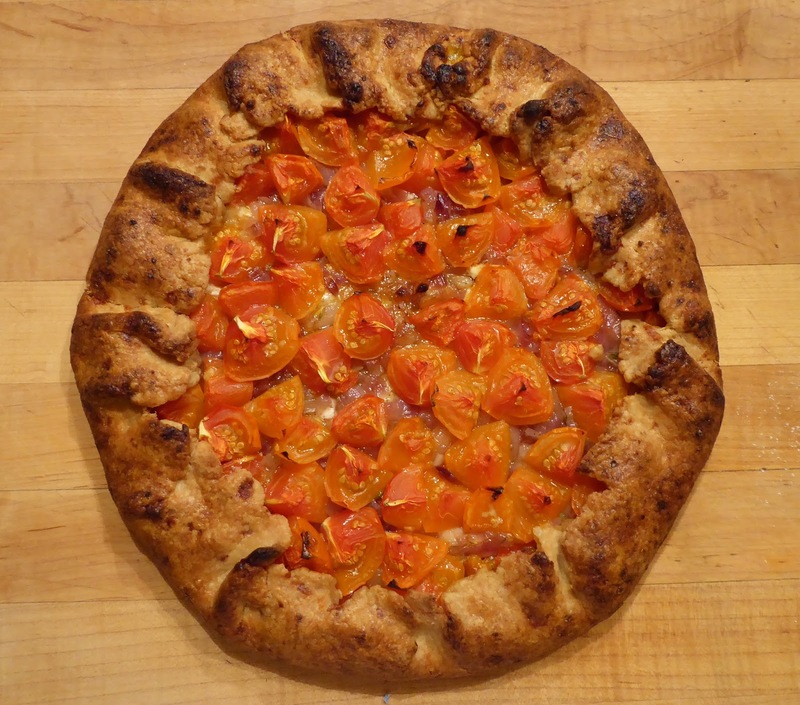 My version used Jaune Flamme tomatoes instead of cherry tomatoes and I used my favorite Sonora whole wheat crust. It's interesting how quickly harvests change. Just a few weeks ago my harvest posts were dominated by green things. 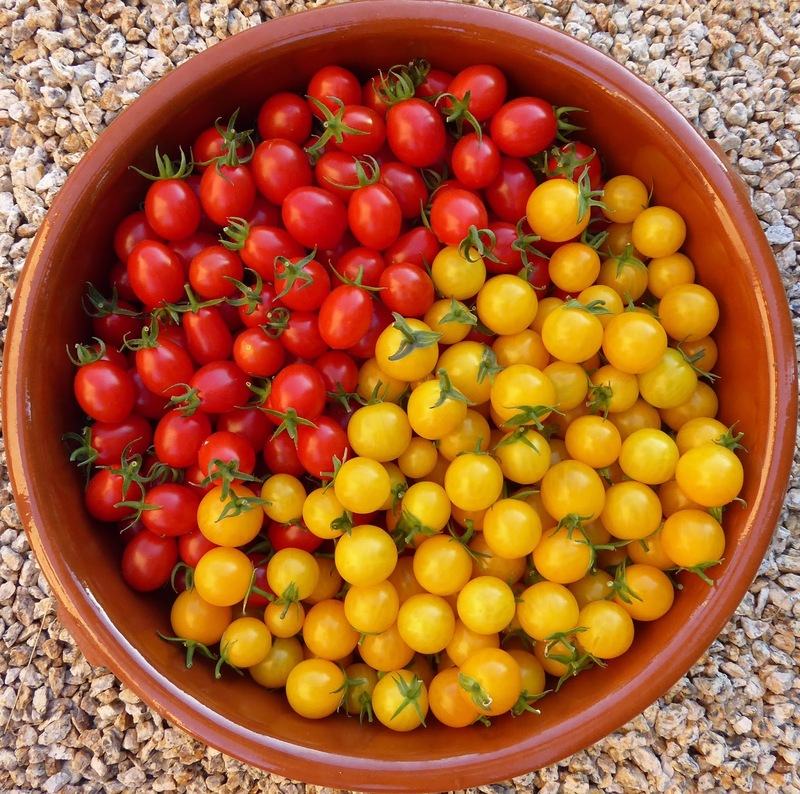 The latest harvests are now dominated by red, orange, and yellow things. I'm most excited about the ripening peppers. There aren't a lot of ripe peppers yet, but there should be more to come. I haven't don't anything special with them yet, just cut up in salads and such. 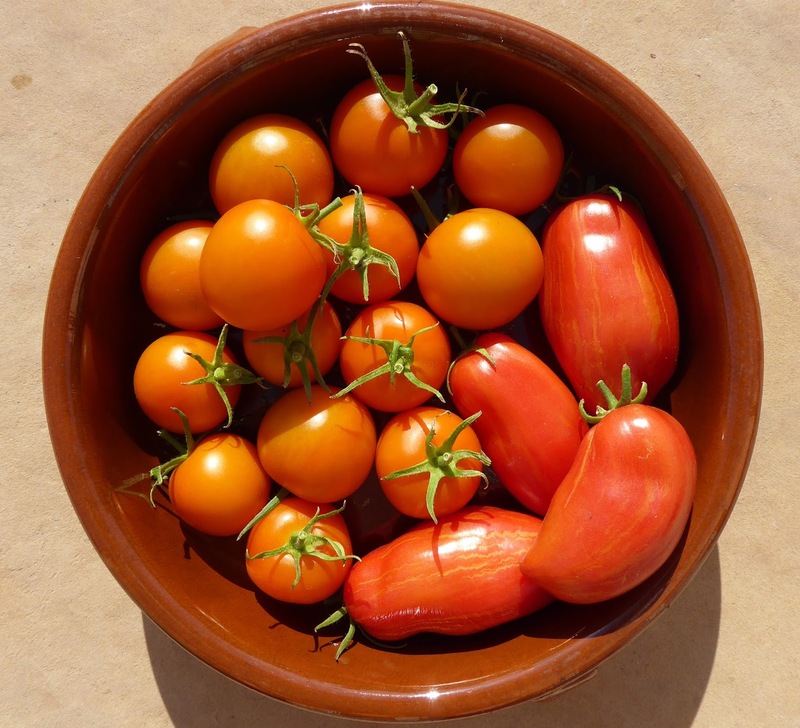 There are lots of tomatoes though, especially cherry tomatoes. 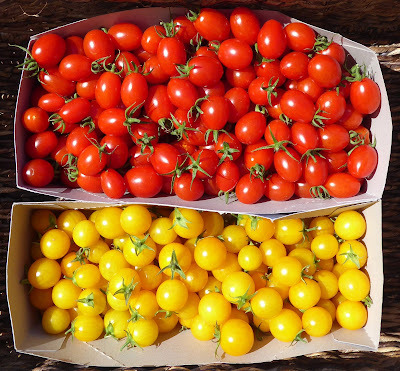 The Bumble Bee types still aren't very prolific but they are tasty and I've got plenty of Piccolo Dattero and Sweet Gold cherry tomatoes so I'm not feeling deprived. I used a bunch of cherry tomatoes in a Farro Salad inspired by a recipe on Food 52. I didn't follow the recipe exactly but kept pretty close to it. Jaune Flamme has been one of my favorites for a few years now. It's early, prolific, and very flavorful with a good balance of sweetness and acidity. I made a gazpacho this week with some of them and it came out exceptionally well. Some larger sized tomatoes are coming in here and there. 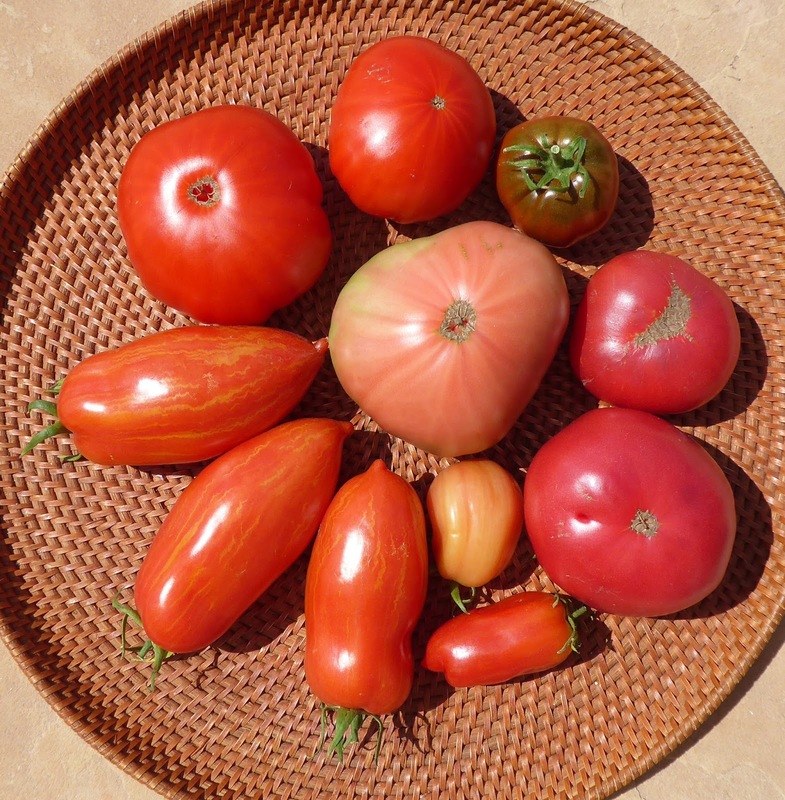 Marzano Fire is producing a number of ripe tomatoes as well. And there's still some green things too. 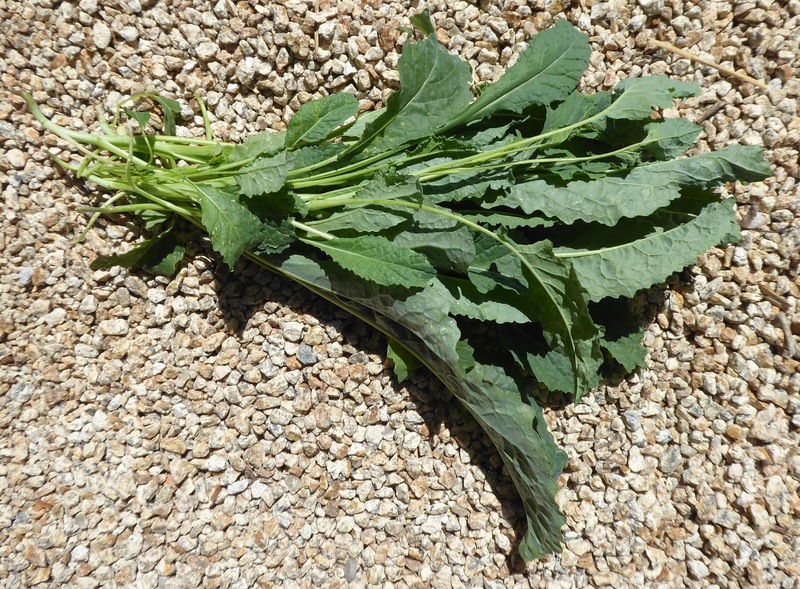 I started cutting the Baby Tuscan Kale to use in salads. There's still a steady stream of broccoli and broccolini sprouts and a few cucumbers here and there. But the zucchini harvests have nearly come to a halt. The Romanesco zucchini plant has almost been done in by powdery mildew so it is about finished for the year. And then I gave the Tromba D'Albenga vines a major trim so they have been slowed down but it looks like they are putting out new growth and new blossoms so I think I should be getting some squash from them in a week or so. I'll start with a couple of shots from above again. The garden doesn't look a lot different from the last tour in August until you get up close. Tomato Alley is easier to navigate since I spent some time trimming leaves and tying up vines. 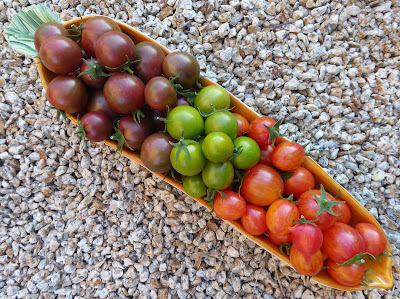 And there's finally some color from ripening tomatoes. The pepper plants are much healthier than last year. Around about this time last year I was losing a battle with powdery mildew for the leaves on most of the pepper plants. And the rabbit(s) were attacking the plants as well. I suspected that the ash from the Soberanes Fire last year was at least partly responsible for the powdery mildew problem. This year I finally surrounded the perimeter of the garden with hardware cloth and had the great joy of watching a rabbit repeatedly trying to get through and failing, at least for now. Here's a few highlights in the pepper patch. Topepo Giallo has mostly "innies" but that one has a pronounced "outie". 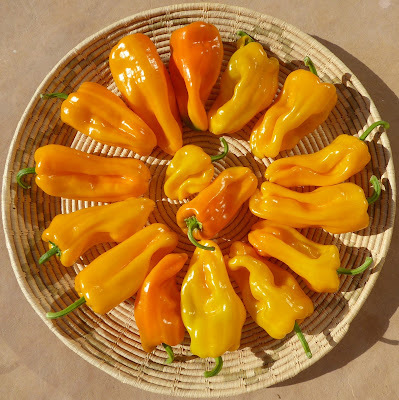 Habanada is a Habañero with nada heat. This and one other new pepper this year are the first Capsicum chinense peppers that I've grown in a few years. 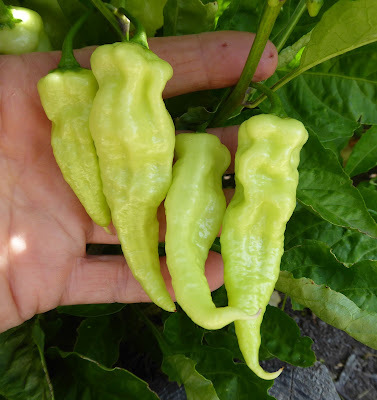 I gave up on chinense peppers because they generally don't ripen before the first frost and the plants are very sensitive to cold temperatures so I usually didn't get much of a crop. It looks like I might have a chance at enjoying some ripe peppers with this one. Bed #2 is mostly corn and beans. And at the moment it is the greatest source of frustration in the garden. Rodents have once again discovered the ears of corn. I covered all the best ears of corn with fabric but I didn't fool the rodents, they just chewed right through the fabric and kept on going when they hit corn. So I've turned to trusty old hardware cloth. Wire dunce caps for corn. If this doesn't work then the corn is hitting the compost. Better there than in rodent bellies. Taos Red is a dry bean that's a beautiful solid red color, but I didn't know that the pods would be red too. O'odham Pink is a bush dry bean. The plants are senescing which means dry beans are soon to come. The cilantro succession experiment isn't doing so well anymore, something is munching on the emerging seedlings. I beefed up the screens around the patch so perhaps that will help. (I am the Queen of Hardware Cloth). 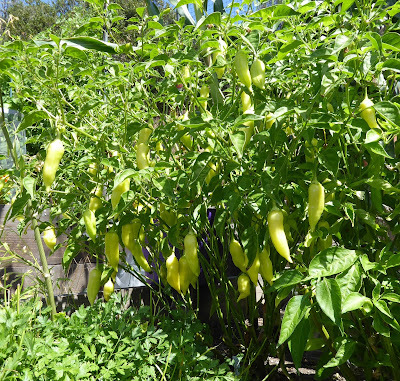 The Mareko Fana pepper plant that came back from last year is doing even better this year. There's a bunch of really beautiful peppers on the plant and better yet they are starting to ripen. This has become my favorite variety for turning into dried pepper flakes. The Baby Aji Amarillo pepper plant from last year is doing better than ever also. It's loaded with peppers and they're beauties. 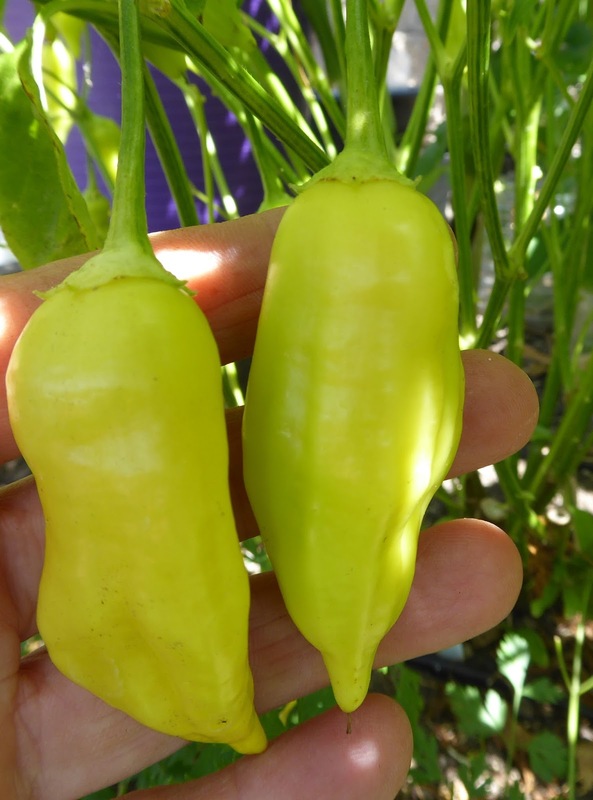 There's a couple of Aji Amarillo Grande plants growing between the Mareko Fana and Baby Aji Amarillo plants that came back from last year but I think I should just take them out because they aren't doing anything and what's odd is that they were huge last year. 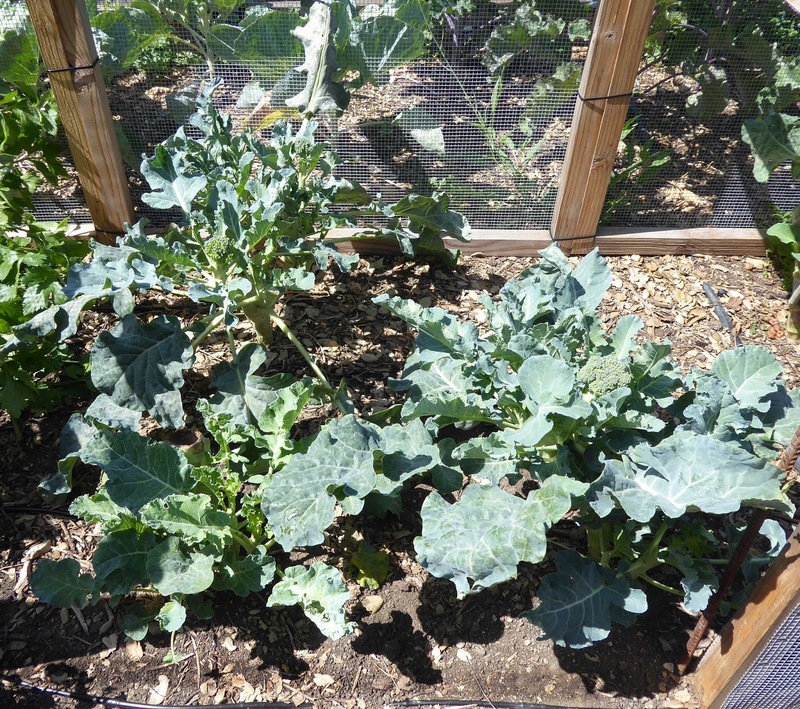 Shown above are the 4 broccoli plants that I set out way back on December 7. Yup, 9 months ago. And they keep on producing side shoots, and some really nice ones too. Every time I think they are done I spy some new growth. In the photo below are 3 of the 4 broccoli plants that I set out on April 14. These plants are the ones that were supposed to get me through the summer after I tore out those other plants, but the rabbits dined on the first round of side shoots and the plants have struggled ever since and one of them simply gave up. I was on the verge of pulling the newer broccoli plants when I noticed a lot of shoots popping up through the soil at the base of a couple of the plants. I thinned out most of them and it looks like some of them might grow to become good sized shoots so for now I'll let them grow and see what happens. That's my patch of summer cutting greens accompanied by some fennel growing from roots that were left in the ground after I harvested the mature bulbs. I already harvested the Ethiopian Blue Mustard and started cutting down the Baby Tuscan Kale yesterday. I'm definitely going to sow more of the mustard, it's very mild either raw or cooked and I enjoyed it both in salads and wilted like spinach. 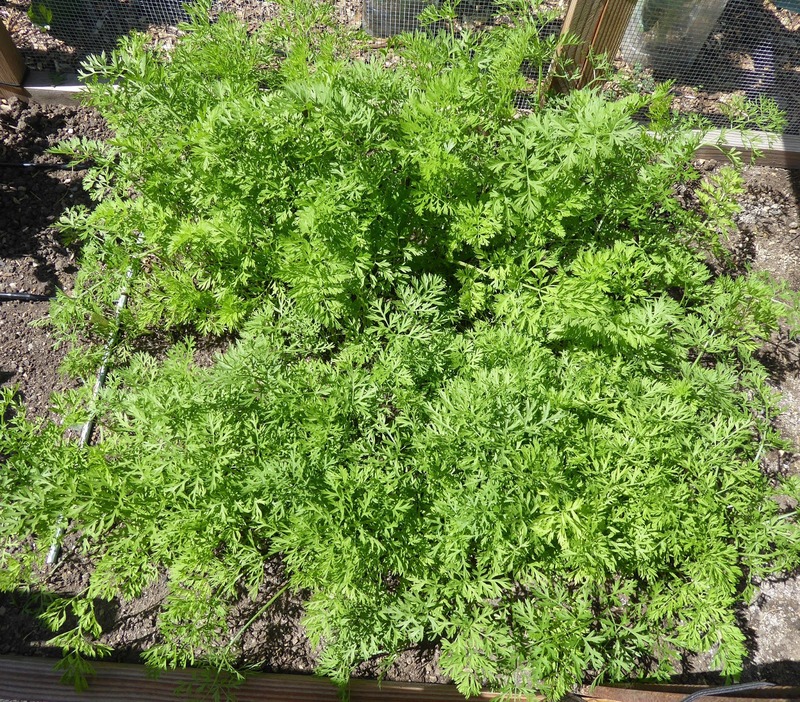 The carrots have gone through a growth spurt. That's them after some serious thinning. 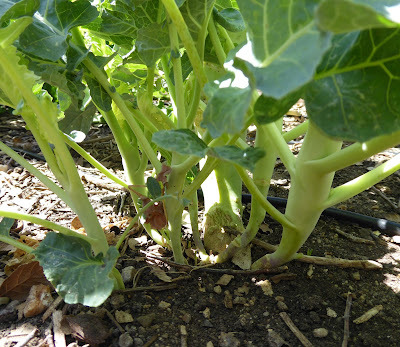 The Broccolini plants (aka Aspabroc) don't put out side shoots that rival the Batavia broccoli but these plants have supplied a steady stream that has been enough to keep us happy. They are shown above after a good hard trim and perhaps they'll come back but I'm going to remove them soon because their successors shown in the photo below are growing fast and should start heading up soon. The Gustus Brussels sprouts plants are looking a bit funky probably because they've been supporting a small population of aphids that I never got around to treating. The excessive heat that we experienced a couple of weeks ago probably didn't help either (the high hit 109ºF in the shade). 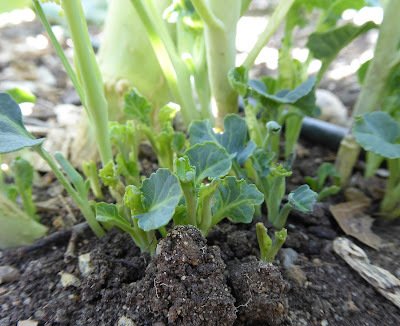 The Kalettes seem to be really happy in spite of also hosting some aphids. 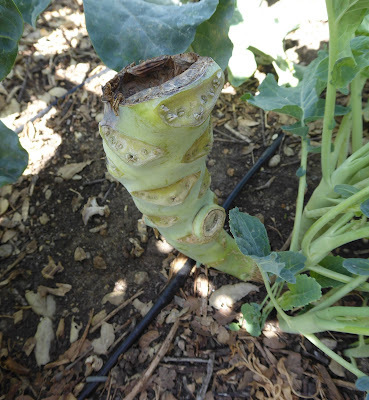 The Stick Cauliflower plants don't get to be very large, but one of them is extra small after it got attacked by something that left a lovely slime trail. Slug or snail? I don't know because I never found the culprit. Slugs and snails are rarely a problem in my garden but the extra wet winter this year seemed to cause a bit of a population boom of slugs and I keep finding one or two here or there in damp spots like the compost bins so it's probably slug damage. 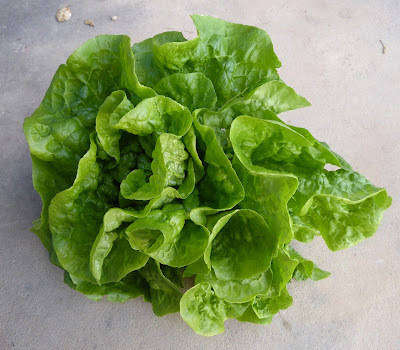 I finally got around to growing some lettuce and thank goodness it's a heat resistant variety because I transplanted it about a week before the heatwave hit. 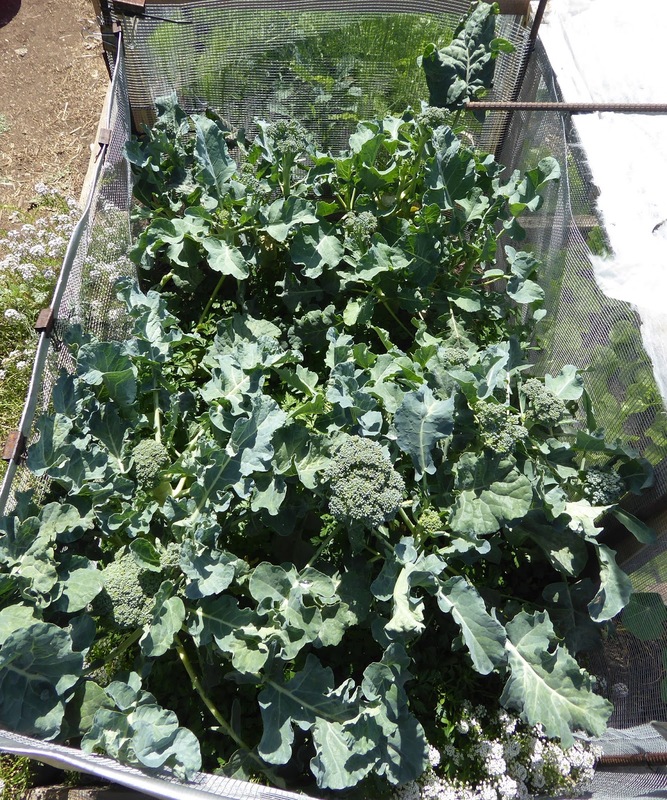 The extra seedlings are bunched together above for early harvest as babies. Just in time for BLTs! The rest of the lettuce is in a cage along with a couple of succession sowings of Speedy Arugula. 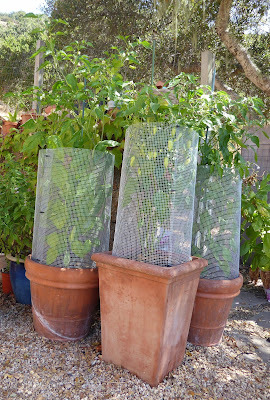 The cage is not only rabbit and rodent resistant but it's also easy to cover up with some fabric to provide some shade. I'm hoping that the shade will keep the lettuce mild and prevent the arugula from bolting instantly. I covered the entire bed through the worst days of the heat wave. The murkiness wasn't fog it was smoke from fires in the central part of the state. And we've finally come to Bed #4. 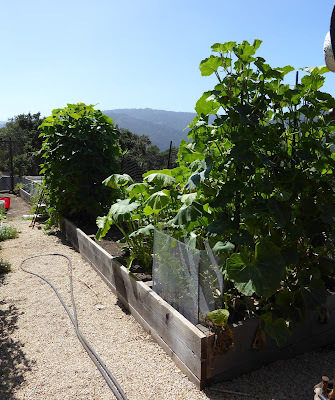 The Tromba D'Albenga vines were until quite recently not only covering the trellis but were also scrambling through the bed and along the path. All that foliage was providing cover for some rodent that was insistent about making a burrow in the nice soft soil in the bed so I gave the Tromba vines a major haircut. I should have trimmed them back long ago because they've responded by simply putting out a lot of new growth and new flowers. 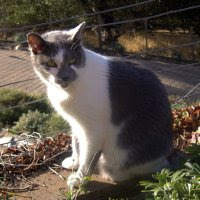 The Damn Rodent seems to have decided to look for new digs elsewhere. 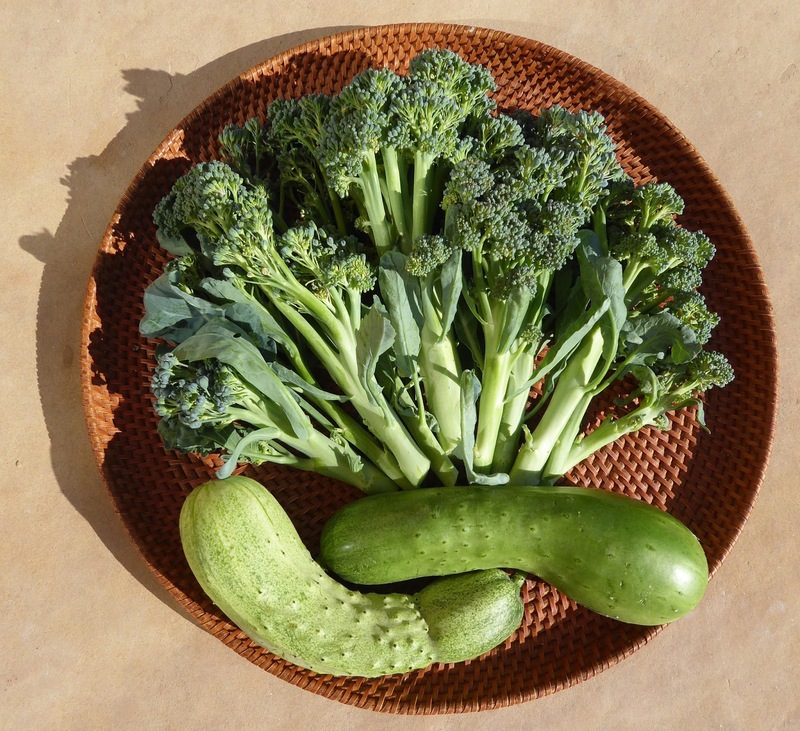 The Romanesco zucchini vines are shrinking. The powdery mildew is doing a quick takedown job on the plants. I've been cutting off the infected leaves faster than the plant can produce new ones so it will soon be history. The cucumber vines, on the other hand, are still going strong. The Gagon vines in particular are growing like crazy. I was about to give up on them though because they were producing almost all male blossoms. Then Day pointed out to me something that I never knew about cucumbers, that they are day length sensitive which causes them to produce mostly male blossoms in the summer. So I've let the vines continue to grow to see what effect the shorter days of fall will have. The basil plants at the end of the bed have in turns gotten huge and cut back and threatened by encroaching zucchini and cucumber vines and in spite of all that they keep coming back after I give them hard whacks. They look like a motley bunch of plants now but I'm getting enough basil to keep me happy. 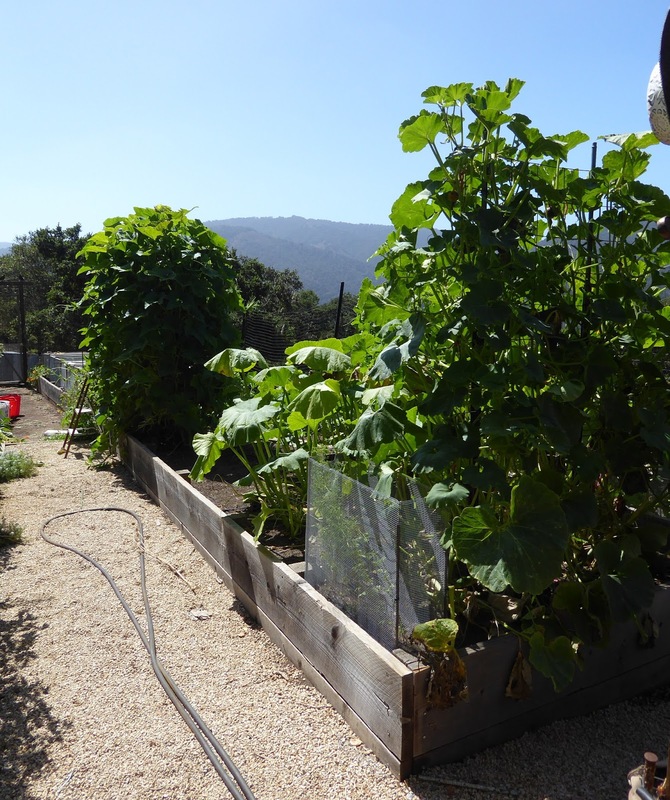 And can you see the squash vines that have taken over the path and climbed the fence? I was really close to cutting those down until I notice those two squash and there's a third one developing also. So I took pity on the vines because the 4 plants had up until then set exactly 2 squash. 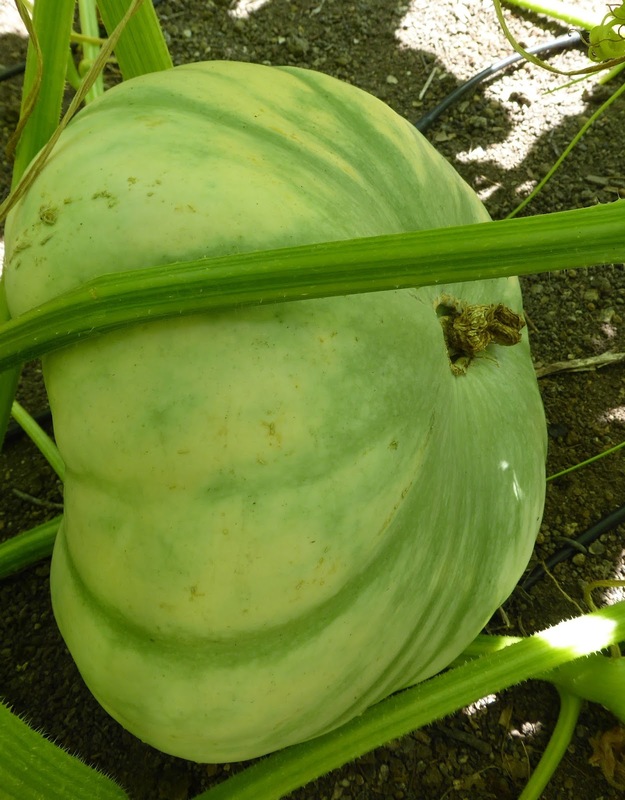 Those squash are at about the same stage of development. 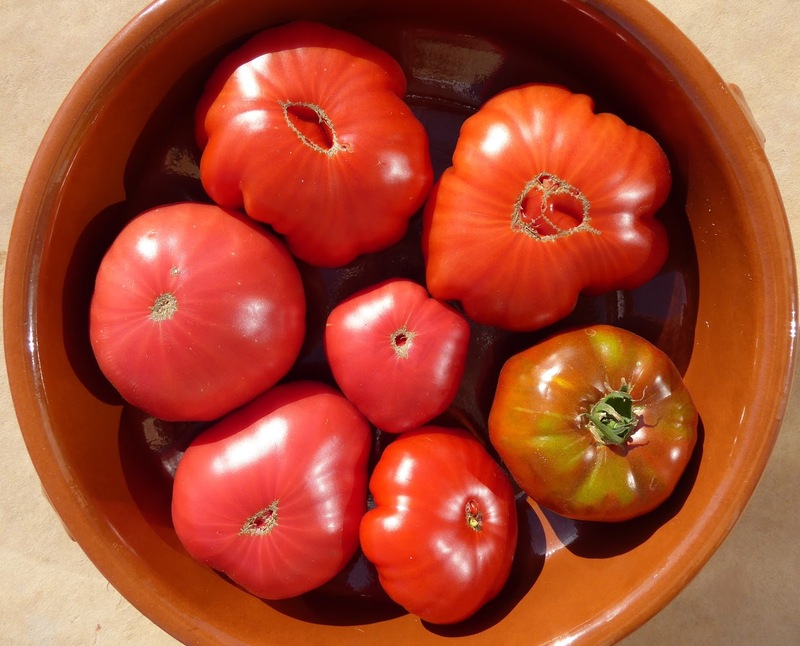 It's a landrace variety that hasn't been chosen for external colors so the exterior colors include blue, green, pink, and orange. The interiors are all dense fleshed and deep orange. The other squash I'm growing this year is Kurin Kabocha which has more compact vines and squash so it's growing on a trellis. 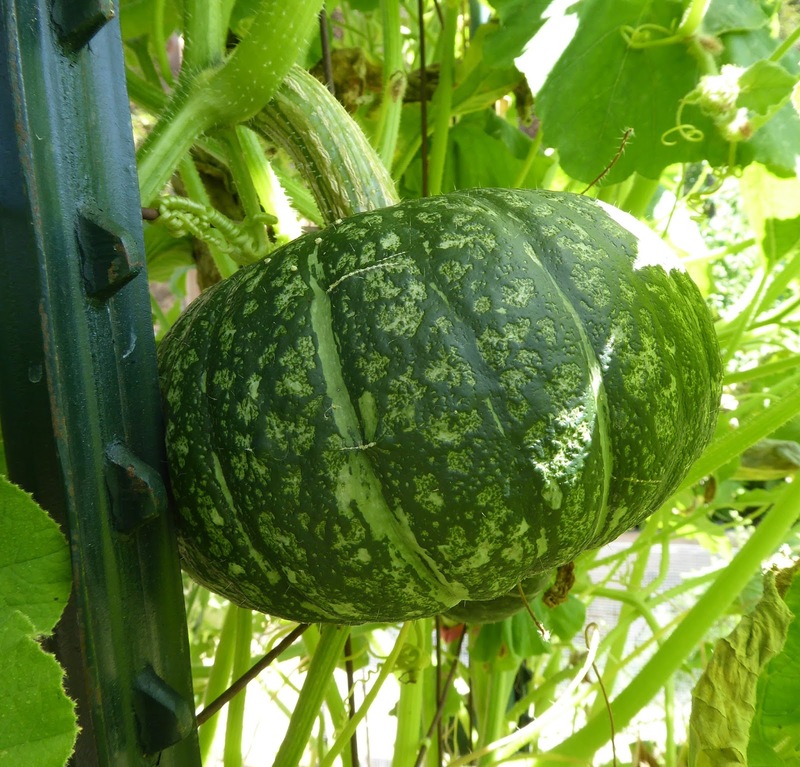 The vines have set a number of squash, mostly pretty small but there's a couple of larger ones like that one below. That's the latest in my garden. Oh wait, I almost forgot. I'm growing some Aji pepper plants in pots near the house to not only get extra peppers (I love Aji peppers) but to also try to coax them through the winter without taking up a bunch of space in the veggie garden. Things were going fine until some critter (rat or rabbit?) decided to start munching. So the Queen of Hardware Cloth went to work again. OK, that's really finely truly it for this tour. Hope your garden is growing happy.